I don’t know about you, but I’d say those are some pretty impressive numbers, and if you only include Johan’s last three performances, they are even more outstanding. Sunday’s masterpiece also helped Johan lower his season ERA to 4.61, well on its way to a Johan-ish level (somewhere in the low-to-mid 3.00s). So far in June, the Twins have a record of 11-7. There have been a few very noticeable blemishes (losing 3 of 4 to the Deviled Hams and 2 of 3 at home to the Phillies), but somehow, at least record-wise (the only statistic that actually matters) it has been a pretty good month for the hometown nine. How has this happened? Our offense, which was absolutely putrid in May, hasn’t been a whole helluva lot better in June. The Twins are hitting a collective .248 this month, with a measly .319 OBP. They’re averaging a mediocre 4.6 runs per game, which is not a figure you would expect from a team that is consistently winning ballgames. But the Twins have finally returned to their old tried-and-true method of winning: pitching and defense. Even after his baffling meltdown on Saturday night, Brad Radke still has a 2.28 ERA and 1.12 WHIP in June (all without collecting a win!). Carlos Silva has also performed admirably, notching 2 wins to go with a 3.16 ERA in his four June starts. Even the enigma that is Kyle Lohse has been respectable, posting a 3.79 ERA and 1.05 WHIP in his three June starts. As hard as I was on him the other day for giving up four sixth inning runs, he really didn’t pitch that badly overall. The bullpen, which hasn’t quite lived up to the lofty expectations that stemmed from their April and May dominance, has been pretty decent as well in June. Juan Rincon (who will get his own column one of these days) has been spectacular this month: 10 scoreless innings, 2 vultured wins, 5 H, 3 BB, and a whopping 14 strikeouts. He is almost single-handedly responsible for holding the ‘pen together after the implosion J.C. My man Grant Balfour, despite his moments of shakiness, has only allowed a run in 5.1 innings pitched. Joe Nathan has also been his dominant self, although not as lights-out as he was in April and May. Even Fultzy and Mulholland haven’t been completely terrible. The Twins’ fielding hasn’t improved quite as much statistically in June as the pitching did, but the team is slowly climbing up the charts in fielding percentage in June (they now sit at 10th in the AL) and their have been a number of spectacular plays made this month. Torii has been making great catches left and right, and even Louie Rivas is flashing some leather. Although the numbers might disagree somewhat, defense has also played a big role in the Twins’ stellar June record. Johan’s tremendous Father’s Day performance has really helped bring to the forefront the Twins’ improved pitching in the month of June. With a rotation that has four guys (Radke, Santana, Lohse, and Silva) all pitching well, I don’t see why the Twins can’t expand upon their 1.5 game lead in the division during the upcoming week. It’s that time of year again and the Twins should hope to be players in this year's trade market. From about mid-June until the trade deadline rumors heat up and deals go down. Some teams, like the Royals, are already out of it while others will wait around a little bit longer before gutting their pieces. There are many spare parts and a few studs out there. The Twins are a team hoping to get over the hump this year and advance in the playoffs. Anything is possible with the current roster but an upgrade would greatly improve their chances. What do they need and what is it going to take for people to be calling the Twins world champions come October? It is hard to tell where to start when considering what the team's greatest need is. There are numerous areas of weakness but if the Twins hope to advance in this year's playoffs they must add an Ace starter. Pitching makes all the difference in the playoffs and right now the Twins don't have 3 or 4 pitchers capable of shutting down a team. Brad Radke has pitched very well and once again the team will rely on him to win. He is followed by Johan Santana who had mixed results last year against the Yankees. This year he needs to shake off freak injuries and come up big for the Twins to advance. Carlos Silva has been great this year and will earn the right to start in the playoffs but no one should expect him to shut down an opponent. He just allows too many hits and lacks experience. Kyle Lohse has been inconsistent his whole career and a big game will only get him more exited and more inconsistent as has happened before. The problem is there aren't many Aces available out there. The ones that are, are not considered true Aces but cost as much as one. So the team might have to go ahead and gamble on what they've got in the playoffs. Nevertheless, they need to at least add a veteran starter before the deadline. Right now the fifth starter has been a major void and no one has emerged. It could be JD Durbin or Joe Mays in the end but this team can't wait. The second biggest need is a big time hitter. Unfortunately most of these hitters play positions the team is already stacked at. This move is unlikely to happen but it would be nice to go into a playoff series with a player capable of driving in some runs. Perhaps a Jacque Jones and a prospect deal would be the ticket. The past two years the Twin's bats have been shut down in the playoffs. It doesn't matter how well your pitchers throw if you don't score any runs. A .400 OBP. and 30-40 homerun guy in the middle of the lineup would look very good but once again could be quite costly. Before the end another middle reliever would really help the staff. This might be the cheapest item on the market but still may be overpriced. To this point the bullpen has performed admirable especially with the meltdown of JC Romero. The bullpen lacks depth and proven pitchers. A high quality set up man would help everyone out. Juan Rincon has performed very well but a second option will cause other teams headaches and keep him fresh not to mention if he should falter. At the beginning of the year everyone was calling for a middle infield addition. That speculation has cooled with the improved play of Cristian Guzman and Luis Rivas. I don't think this team needs someone to start over these guys or could find anyone better. What they need is a guy good enough to start who can hit a little bit off the bench. That way if Rivas gets into another slump they will have an option to replace him. Also he adds flexibility to late inning personal changes. Nick Punto will be a welcome addition with his return. The team is going to have to give something up to get help. They have a glut of outfield prospects that are ready to play in the majors. Mike Restovich might look very appealing to other organizations but in this one really doesn't have a spot. The team should be willing to part with him. Grant Balfour is another player who has a lot of talent but has yet to prove himself. I would not part with JD Durbin or Jesse Crain unless the team was blown away with a player. The Twins have a window of opportunity and just about anyone else should be made available to make postseason glory possible. Justin Morneau might be the team's most valuable asset. They should do their best to hold onto him. Out of all the prospects that have come up he has the best chance to provide the power this team has lacked since 1987. He might be hitting cleanup for the next 10 years. He might even be a valuable weapon for the Twins down the stretch this year at a cheaper cost then anyone they try to trade for. This is a team that needs to be active in this year's trade market. They have to be smart and identify needs without overpaying for players with some kind of fault. Terry Ryan has been very good about being creative and getting more then he should for AAAA type players. He needs to bring that same mentality to this year's dealings. The competition is only going to get stronger and the Twins must follow suit. The time is now and nobody knows when the window of opportunity closes. Even if Nathan doesn’t continue his recent dominance (Sunday’s near-disaster notwithstanding) and is only respectable, he’s an almost sure-fire lock to make the team as a reliever. Joe Torre always likes to carry plenty of closers and middle relievers on his All-Star teams, and Nathan is one of the top three or four closers in the AL right now. Obviously Torre will take Mariano Rivera, and Francisco Cordero (Texas) and Keith Foulke are strong candidates as well. Outlook: Barring an unforeseen collapse, Joe Nathan will almost certainly be representing the Twins in Houston come July. I want to first off give this little disclaimer: I am a HUGE Lew Ford fan. In fact, I took the liberty of naming him the Official Player of Twins Chatter before he even reached his full sweetness. But Lew, as much as I love him, is not an All-Star. John and Mimiru did a good job of explaining just why yesterday, but it simply comes down to the fact that outfield is an extremely difficult All-Star position to crack. Manny and Vlad are locks, and Sheffield or Damon may (undeservingly) be the third OF starter, which would only further diminish Lew’s already-slim chances. In a perfect world, Ford might be rewarded for his excellent first half with an All-Star bid, but unfortunately, the All-Star selection process is even more flawed than the rest of the world. Outlook: Unless Ford goes on another tear like he did in April, his chances of making the All-Star game don’t look good. Few of the Twins “core” players, they guys you would expect to warrant All-Star consideration, are even in the running this year. Hunter is actually 9th among AL outfielders in the voting right now, but he doesn’t deserve to be. Torii was a deserving starter in 2002, but injuries have limited him to just 8 HRs and 24 RBIs this season. Corey is tied for the team in home runs with 10, but a batting average in the .250s isn’t going to cut it any year. Before his horrendous 1 for 37 slump, JJ was actually a viable All-Star candidate. But obviously that's not the case anymore, as his splits are .255/.314/.447. Dougie Baseball has struggled with the omnipresent injury bug, but when playing he’s been one of (if not the) worst offensive first basemen in the majors. My picks: If the game was to be played tomorrow, I believe Joe Nathan would be the Twins’ lone representative. A 31-26 team doesn’t really deserve more than one or two, and the Twins have never been a superstar-laden bunch. But by July 13th, I think that Radke will finally have the record to back up his superb ERA and will sneak in as a starter. 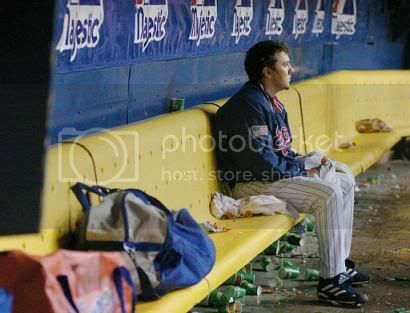 In baseball, things usually have a way of evening out and I'm counting on this to be the case with Brad. Joe Nathan and Brad Radke are my predictions, but I hope Lew comes on strong and makes Torre seriously consider him for a bench slot (although I would be surprised if that happens). Any other predictions/analysis out there? Post a comment below or e-mail me at twinsfan21@msn.com. Thanks for stopping by Twins Chatter again today; please drive home safely. I just wanted to devise a post to welcome all you first-time visitors to Twins Chatter. We've been going strong for about two months now, and although it has been a struggle at times, it has also been very rewarding. Twins Chatter features two writers: myself (Ryan) and my longtime friend John. We're both life-long Twins fans who enjoy writing as well. Also, if you would like to know more about John and I, click here to read a short biography about me and here to learn more about John. Thanks again for stopping by. Be sure and drop by again tomorrow as John will have a new post up. At noon on Monday, the 2004 Major League Amateur Draft gets underway. This year the occasion is extremely noteworthy for Twins fans. The Twins have five of the first 39 picks this year: numbers 20, 22, 25, 35, and 39. No other team has more than three of the first 40 selections; the Twins themselves have never had more than three of the first 50. Four of these picks (each except #20) are compensation selections for the free agent losses of Eddie Guardado and LaTroy Hawkins this past winter, including the latter two picks which will take place in the supplemental first round. For an organization that traditionally builds from within, this is a great opportunity for the Twins to ensure the continued success of the franchise. What I have compiled below contains two parts. Part One quickly reviews the Twins’ recent draft history, and Part Two looks at some possible draft choices for the Twins in the early rounds of 2004. It’s a bit lengthy, but I think it is well worth reading in its entirety. PART ONE: First of all, let’s take a look at the some early-round draft choices of the last few years for the Twins. Ryan Mills- A highly-touted lefthander out of Arizona State, Mills has been a complete bust for the Twins. He has struggled with his control at almost every level of the minor leagues, and was recently dropped from the 40-man roster. Mills seems to have found his niche lately as a mediocre AAA reliever. Not exactly worth the $2 million signing bonus the Twins doled out in ’98. B.J. Garbe- Garbe has been another early-first-round disappointment for the Twins. He has definitely not been the hard-hitting outfielder the Twins envisioned him as, posting an OPS of .508 at AA last year. He has been bad this year also, hitting only .232 through Sunday. 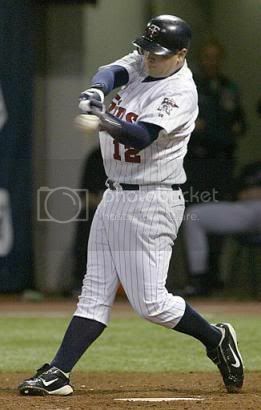 Rob Bowen- Bowen has done about average for a second-round pick, as he is currently the AA catcher for the Twins and has seen some time in the majors as well in ’03 and ’04. He might still become a serviceable major league player, but the Twins are obviously not the right organization for players at his position (more on that later). Aaron Heilman- The Twins drafted Heilman out of Notre Dame, but were unable to sign him. Heilman signed with the Mets the next year, and has been one of their top pitching prospects, although he has struggled in the majors this year (6.75 ERA). Joe Mauer- What more can I say about this guy that hasn’t already been said? Mauer has as good as advertised thus far: a patient, high-average hitter who is outstanding behind the dish. There was some controversy when the Twins chose Mauer over Mark Prior, but as Jim Souhan said in the Strib Sunday, the decision was a no-brainer. And hey, don’t look now, but Mauer collected his first ML home run, extra-base hit, and RBIs in Sunday’s game! Hopefully these are the first in what promises to be an illustrious career for the 21 year-old. Scott Tyler- The jury is still out on Tyler, as he is only 21 years old. He is a great physical specimen (6’5”, 210) but he hit a little bump on the road last year at Quad Cities after a solid season at Elizabethton in ’02. He has been hurt for much of this season and has only made 4 appearances. Denard Span- ’02 marked the first time in almost a decade that the Twins did not have a top-10 draft choice. Management knew that Span would most likely take time to develop, as he was a rather raw high school player when drafted. Span, who had a decent season at Elizabethton last year, has struggled at times this season in Quad Cities, although reports say he is making progress. He projects as a lead-off man in the Kenny Lofton mold. Jesse Crain- Every Twins fan worth his (or her) weight in off-color Teflon has heard the name Jesse Crain. A closer/shortstop from the University of Houston, Crain absolutely dominated the minor leagues these past two seasons, tearing through the Twins minor league affiliates like paper. He has been merely human this year at Rochester, posting a 3.81 ERA to go along with 12 saves. Crain has 98-mph fastball, a plus changeup, and a devastating breaking ball that Ron Gardenhire referred to as the “curveball from hell.” One of the better draft choices by the Twins over the past few years, he should see time with the Twins at some point this season. Matt Moses- Last year the Twins drafted the swing-swinging 3B Moses as a high school player. He was good in rookie ball last year, but has struggled somewhat with injuries, including a heart defect and back problems. Hopefully he will be okay, as he’s just 19 years old (actually 5 months younger than me—how weird is that?!). Scott Baker- A standout pitcher at Oklahoma State, Baker has limited upside but has performed well thus far in the pros. He was very good at Fort Myers earlier this year (2.40 ERA in 7 starts, with only 6 walks in 45 IP) and earned a promotion to New Britain, where he has gone 3-0 with a 1.50 ERA. Everything I read says he projects as a middle-of-the-rotation starter in the big leagues, which isn’t bad for a second-round pick. Whew! We’ve gone over some recent draft history for our beloved Twinks, and as you can see the results have been somewhat less-than-spectacular. Many people refer to the draft as a “crapshoot,” implying that there is almost no way to know whether or not the player you’ve selected will pan out. But I’m not willing to concede that point just yet, so let’s take a look at some of the players the Twins are considering for their first three selections in this year’s draft. Fields, who was also OK State’s star QB the past two seasons, probably won’t be around when the Twins pick at #20. If he is, I hope that the Twins draft him. Fields is a great college hitter with good power (12 HRs last year) and shows potential defensively at the hot corner. The Twins organization is sorely lacking in infield depth, and as a relatively advanced college player Fields would help fill a need. Also, he doesn’t project as an NFL quarterback so that can’t be used as bargaining leverage against the Twins (no Drew Hensons here). Perkins and the Twins seem like a match made in heaven. The Twins, as we all know, have always sought to draft hometown kids and Perkins (who is from Stillwater) is extremely talented to boot. His fastball reaches 92 mph, he has a very good changeup, a plus curve, and has good control as well. The only knock on Perkins is that he’s not very big (5’11” 190) but I’m not too concerned with that. His relative lack of stature also means that the Twins will undoubtedly have the opportunity to draft him (probably with their #25 pick) and I would be shocked if they didn’t. I think that the Twins may possibly draft Szymanski only if they choose to go the “best available player” route. It is well publicized that the Twins aren’t hurting for outfield talent, but Szymanski sounds like he might be too good to pass up. Dubbed a 5-tool player by scouts, he’s a 6’5”, 215 switch hitter with a sweet stroke from both sides. His outstanding speed also should help him in the outfield. He hasn’t faced the best competition (playing in the Ivy League) so many scouts are anxious to see how he fares in the Regionals (update: not that well, unfortunately). I haven’t heard much about the Twins in connection with Szymanski, so I doubt that they will draft him. But you never know. I’m going to stick with the collegiate player theme and profile the Miami sensation Ferris. Ferris is the epitome of a “Moneyball” player: college hitter with very good plate discipline, mediocre fielder with little speed, and great power numbers. Despite the fact that he only emerged as a prospect last year, he sounds like a pretty safe pick (relatively cheap as well). I wouldn’t mind seeing the Twins draft him (despite the fact that we already have Justin Morneau), but it sounds like he will probably be snatched up by another budget-conscious team before the Twins, such as the Royals. If both the Twins and Royals pass, I’m sure Billy Beane will ecstatically draft him at #24. Purcey, also one of the top lefthanders in the draft, is an interesting case. He has been extremely inconsistent throughout his career thus far, which, despite his enormous physical gifts (the lefty is 6’5”, 240 with a 95 mph fastball) has scared some teams off. This spring he appeared to put it all together, sharpening the command of his fastball, curve, and change (he had 54 walks and 130 strikeouts in 118.2 innings this year). He’s a risk, but his talent means that he will go somewhere in the Twins range. I would actually rather the Twins took a high school player, because Purcey has the look of an Adam Johnson about him. But it is definitely possible that the Twins will take Purcey at either #22 or #25. Elbert is considered one of the top two left-handed pitchers in the draft (the best HS one), and it will be a surprise if he’s still available for the Twins at #20 (let alone 22 or 25). He has a 93 mph sinking fastball, a change that also sinks, and a mid-80s slider (which is extremely impressive I think!). I can’t imagine the Twins could pass on him if he’s still available, but it’s doubtful he will be—he’s projected to go anywhere from #10-17. Mike Radcliff, Twins director of scouting, says that the Twins will continue to go after high school pitching despite the obvious cost concerns. Rainville, who comes from the same high school as Rocco Baldelli, put up some absolutely mind-boggling numbers this year: 10-0, 0.18 ERA, 9 walks and 165 strikeouts in 77 innings. It doesn’t get much better than that, even in high school! I’ve seen Rainville and the Twins linked in a couple of articles, so he seems like a pretty likely pick (provided he’s still available). He’s got a 90-94 mph fastball and is 6’3”, 220 lbs—that alone is reason enough to make him a surefire first-rounder. His other pitches are less refined, so it would most likely take him a few years to progress through the minors. I could definitely see the Twins drafting Rainville, although he’s not the safest pick in the world. Blake DeWitt, SS, Sikeston, Mo. I have seen the Twins and DeWitt connected numerous times, and it seems very likely that the Twins will draft him (probably in the supplemental round). Dubbed “one of the safest bets to hit among the draft's high school prospects” by Baseball America, DeWitt and the Twins seem like yet another match made in heaven. DeWitt was only ranked the 65th best prospect by BA, so I hope the Twins don’t stretch and use a regular first-round choice on him to save money. He’s also not going to be a shortstop in the pros and will probably be moved to second or third. Despite this, I would be surprised if the Twins didn’t draft him. In early draft previews, it appeared that the Twins would have a good shot at selecting Hurley with their first pick, but those chances have dwindled significantly as Hurley finished the prep season better than many of his fellow prep stars. Hurley is a scout’s dream: consistent 92-95 mph fastball, 6’4” 192 lbs, with an ability to maintain velocity late in games. I’m sure the Twins would be thrilled if Hurley fell to #20 (I know I would be), but that is looking less and less likely all the time. He will probably go from #10-15. Trevor Plouffe, SS, Crespi HS, Northridge, Calif.
Plouffe also seems to be a likely pick for the Twins in the supplemental round. He was a great pitcher and shortstop in high school, and could do both if he chooses to honor his commitment to USC. He’s probably the second-best prep shortstop in the draft behind Matt Bush (whom the Padres are considering with the first overall pick) and has been compared to a young Robin Yount. But he could also be a pitcher, as he has a 91 mph fastball. I hope the Twins take Plouffe, as shortstop is a position of major organizational weakness. A budget-conscious first round pick, this kid can flat rake, but doesn’t really have a defensive position. Chuck Lofgren, OF/P, Serra HS, Burlingame, Calif. Previously regarded as an outfielder, he struggled at the plate this year and moved to the mound where he has been impressive. Possible supplemental pick. Well, that’s enough for tonight. I hope all of you found this guide to be interesting, informative, and useful. It was actually kinda fun to write, as I hadn’t really taken the time to study this year’s draft before this weekend (usually I start reading stuff weeks in advance). Throughout the day tomorrow (Monday) I’ll post updates as to where these various players go in the draft and who the Twins get. Also, be sure to check out Twins Chatter each and every weekday for more insightful, thoughtful, and somewhat opinionated Minnesota Twins coverage.